Good morning, I hope all have had a good week and been able to enjoy some of the Spring sunshine. Hopefully it will stay for the weekend and we can all head off on soem adventures or maybe play in the garden, looking for fairies perhaps. 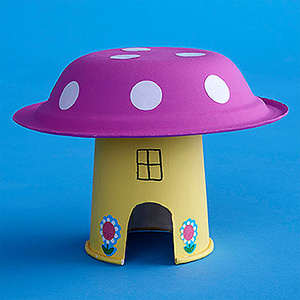 Todays DIY decoration idea would be perfect for hiding around the garden at a Woodland Fairy themed party, as the little toadstools look like tiny fairy houses. They would also work as a table decoration. This is a fab easy craft that could also be an activity at a fairy party.